In a world overrun with forgettable pizza, almost nothing is more forgettable than the frozen pizza. But two Milwaukee area guys have set out to change that. Between the two of them, friends Erik Burgos and Nick Smith, can boast forty years of food service industry experience. Smith is trained in the culinary arts, and Burgos has a wealth of experience in commercial kitchens, as well as front of the house duties. Then never dreamed they'd end up using all that experience to start a pizza company. But, that's exactly what happened. Burgos and Smith created their recipe for thin, crispy pizza while working at an indoor batting cage in New Berlin. 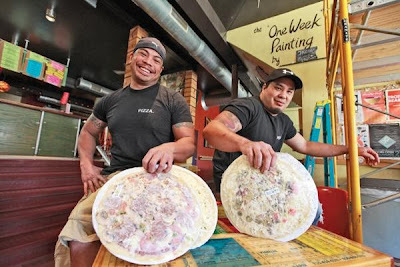 Rather than cooking the same frozen pizzas for kids' birthday parties every week, Burgos and Smith decided to create fresh-from-scratch pizzas for the kids to eat between their swings in the batting cages or shots at monsters in the arcade. The pizzas became a hit, with the parents as well as their kids, and the two friends knew they were on to something. Since Chicago and New York both have their own styles of pizza, Nick and Erik decided that it would be time for Milwaukee to have one as well. So, they honkered down in their apartment and came up with some ideas. 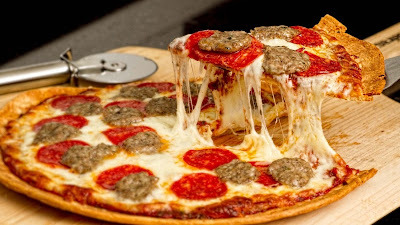 What resulted was a thin, yet crispy and flaky style of pizza that they affectionately named "Milwaukee Style Pizza." After almost a year of testing, refining, and testing again, they eventually created a product that they could proudly put Milwaukee's name on it, and the company that was created from this was named the Milwaukee Pizza Company.